I am still not done sharing all the photos we took in Cape Town, so there will be one more Cape Town related posts before I continue with outfits I was wearing in Berlin as well as the next travel content: New York and Costa Rica. 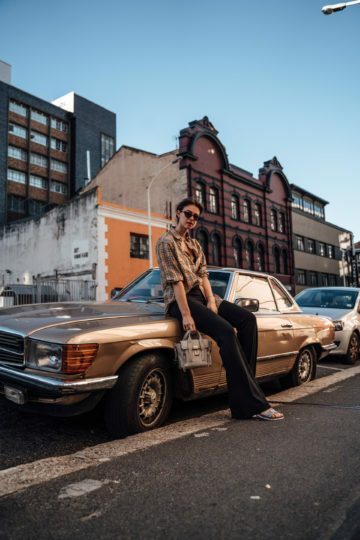 Actually, I had planned to talk a little bit more about Cape Town as a travel destination in my posts, but I ended up sharing more about the outfits I was wearing as well as outfit related guys. And even for the last post from this trip, I will focus on the outfit. But, if there is anything you really want to know and couldn’t find in any of my other posts from Cape Town, don’t hesitate to leave me a comment and just ask – I will be happy to answer all your questions. The outfit I am sharing with you today is the one I was wearing on our arrival day. It was very windy in Cape Town, and due to that it was a little bit fresh outside, and I couldn’t wear all the summer clothes I had brought with me. 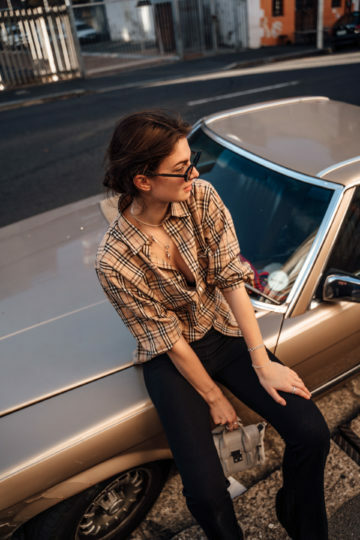 Luckily I always pack a few warmer pieces such as this Burberry Shirt and these black pants. They did not only keep me as warm as possible but also are super comfortable and were the perfect travel outfit for our arrival day. Because as you might remember, we arrived in Cape Town around noon and even though we were quite tired, we had to stay awake as long as possible. And what is better than wearing something super comfortable when you are tired? Exactly, nothing. Of course, I could have put on a pair of sweatpants and a hoodie or something like this, but we wanted to explore the area around our accommodation a little bit and have dinner in a restaurant, and that’s why I opted for this outfit instead. The pants are one of my favourites for spring and colder summer days. They have the perfect length, and I also like the cut a lot. 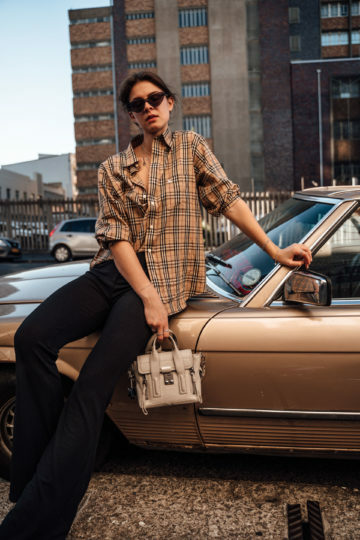 I would either combine them the way I did it in Cape Town – with an oversized shirt – or with a crop top, a t-shirt or even a hoodie. There are endless options on how to style these black pants. That’s also the case with the oversized Burberry Shirt. It works with black pants, with skinny or mom jeans and I would also style it with a pair of shorts or a skirt. 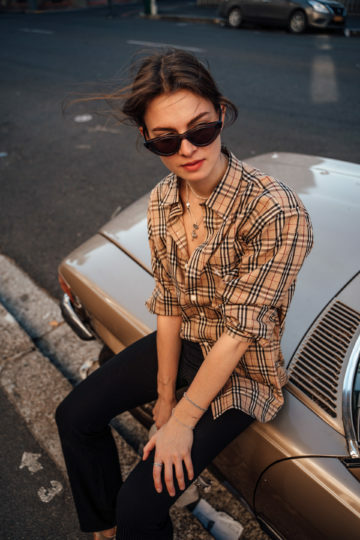 I can’t think of anything I wouldn’t wear with this Burberry Shirt. How about you? Before I end this post, there is one last thing about Cape Town. I want to share with you. Cape Town is an amazingly beautiful city, but it also has its downsides you need to know about before planning your trip. Amongst other things, criminality is something you need to be aware of. We first didn’t really think about it. We didn’t feel unsafe or had experienced anything in the first two days. Then we had bad luck and got robbed. Well, Sophia was the one who got robbed, and we couldn’t really do anything about it. We were shocked by how aggressive they were. They grabbed her necklaces and wouldn’t let go of her until they had them. They weren’t trying to get our cameras or bags, and locals told us that’s because they are only stealing small things they can put in their pockets. The locals were very helpful in this situation. They saw us getting robbed, jumped up and ran after them without hesitation. They had no luck, but at least they tried, and the necklace the robbers had wasn’t important to Sophia, so that was good luck in a really bad situation. Have you ever been to Cape Town and experienced something like this?